The Pits is a realm of Oblivion, created and ruled over by Peryite, the Daedric Prince of Pestilence. Here, Peryite guards the lowest orders of Oblivion. The realm resembles the Deadlands, with lava seas, volcanic islands and ruined structures. The realm is usually completely inaccessible to mortals,[UOL 1] but there have been several exceptions. In 3E 433, five worshippers of Peryite performed a ritual at the Prince's hidden shrine, located along the banks of the Silverfish River in Cyrodiil. The spell was intended to summon Peryite, but instead, the souls of the worshippers were sent to the Pits, where they became trapped. The Champion of Cyrodiil stumbled upon the motionless bodies of the worshippers by the shrine, and was tasked by Peryite to travel to a plane in the Pits and recover their souls. 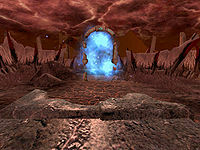 The plane consisted of a volcanic island inhabited by many daedra, with a Blood Well tower and a series of volcanic caves called the Sightless Grotto. The Champion rescued the souls of the worshippers and returned them to Tamriel to earn the Prince's favor. In 4E 201, Peryite tasked the Last Dragonborn with slaying Orchendor, a former priest of Peryite who had abandoned the Prince. In death, Orchendor's soul was sent to the Pits, where Peryite punished him for his disobedience. This page was last modified on 23 September 2018, at 18:53.